Tiffany Hudson is co-founder of The Nova Collective (Nova), a minority and women owned business that helps companies build inclusive cultures. Nova delivers engaging content & communications, identity & learning programs, experiential training, and digital products — all with an explicit focus on diversity, equity and inclusion. They work with organizations to create cultural evolutions and center the voices of the too-often-marginalized. Tiffany’s passion for true equity in the workplace propelled her to quit her promising corporate career, and bring her passion and working life together to challenge the ideas of “Business As Usual”. As a Black lesbian, Tiffany has witnessed inequity throughout her journey and has refused to have her identities minimized along the way. She has been, and remains, determined to succeed because of her unique perspective and experiences – not in spite of them. 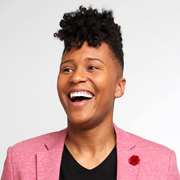 She was named to Business Equality Magazine’s 2018 LGBTQ Leaders 40 under 40, and holds a Masters from Illinois State University, with a focus on Management.